Family Friendly Fridays: Pomtastic! A Story of Ribs and One Very Addicting Drink. And so our story begins. 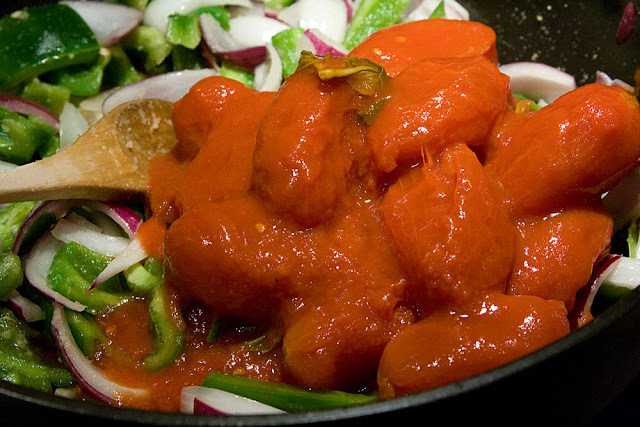 Once upon a time there was a lowly food blogger looking for ideas on what to make for dinner. She searched high and low in books and on cooking blogs but just couldn’t seem to find the right dish for her family. The blogger was sheer out of ideas, so she poured herself a Pom and tonic with a twist of lime using the Pom juice she was given from Ryan over at Pom Wonderful and sat down to ponder her dilemma. I promised part two of the mushroom madness and I plan to jump in head first in a quick minute, but before we get entranced with the deliciousness of this soup, I need to share that you, my awesome blog readers and supporters, all voted an awesome total of 155 times which means $155 was donated to the Susan G. Koman Breast Cancer Foundation! It made my day to donate that money on behalf of not just me, but of all my readers as well. Here is the letter I was given after completing the donation. We all put forth the effort, so I thought it only fitting that we all share in the gratitude. Thank you so much for the support you gave for this competition; I love what we were able to accomplish! Before I get started on the post today, I just wanted to remind everyone that voting is still going on through midnight tonight for the Pacific Everyday Food competition. I don’t think I’ll be heading to Napa, but I will be giving an AWESOME donation to the Susan G. Komen Foundation. So hop on over, vote one last time, and let’s see if we can get the donation to $200! You can find the link to donate back on Friday’s post HERE. Family Friendly Fridays: Kelloggs Moms Club Breakfast! It’s time for Family Friendly Friday again! The link up will still be on the bottom for you to add your favorite kid friendly recipes, vacations, reviews, mom posts, etc., however I won’t be posting a recipe today. Instead we’ll be chatting about the most important meal of the day, breakfast! Do you remember waaaay back last month when I posted about heading up to New York for a Kelloggs Moms Club Breakfast? Well that amazing event led me to the place I’m at today, sharing my very own Kelloggs breakfast with all of you! The purpose of the breakfasts has been to get moms talking both online and offline about cereal, morning routines, and the foods that they incorporate into their children’s morning. I learned so much along this journey and I can’t wait to share it all with you! Breakfast Fact 1: Did you know that the daily percentage of sugar kids consume from eating cereal is only 5%? Upon showing up, the lucky ladies were treated to a wide array of Kelloggs cereals including Froot Loops, Apple Jacks, and Rice Krispies. And once again, I had to step it up a notch by putting together a few extras to compliment the cereal bar. On the menu in addition to cereal were some homemade All Bran cereal bars (you can find the recipe HERE) and homemade Special K with Brown Sugar and Pecans Monkey Bread (recipe coming soon!). In honor of the amazing drinks Kelloggs served us when we were in New York, I also put together some homemade raspberry lemonade. Can you say yummy? Check out the sneak peak on this Special K Monkey Bread! Fact Number 2: Did you know that it only costs 50 cents to feed your child a nutritious bowl of milk and cereal? After filling up our bowls and plates with delicious food, everyone headed back to the table and started up the discussion. We talked about the types of breakfast food we typically served our kids, how we handled the breakfast hour in each of our homes and how we defined a healthy breakfast. Partway through the event Trinh, from Kelloggs, talked with us over Skype, educating us on cereal from an experts point of view and answering any questions that arose during the conversation. Fact Number 3: 90% of moms serve cereal to their children for breakfast. 1. What are your go-to convenient breakfast options for your kids? 2. What do you think of when you think about breakfast cereal? 3. Name two to three things that come to mind when you think about breakfast cereal. 4. What types of foods do you serve to your kids when you want them to get the nutrients they need to start the day? So now I’d love to hear about breakfast time in your house! If you have kids, what types of foods do you feed them and what’s your breakfast routine? So it’s Monday again and I don’t know about you, but I’m ready to talk steak. Bison steak that is. 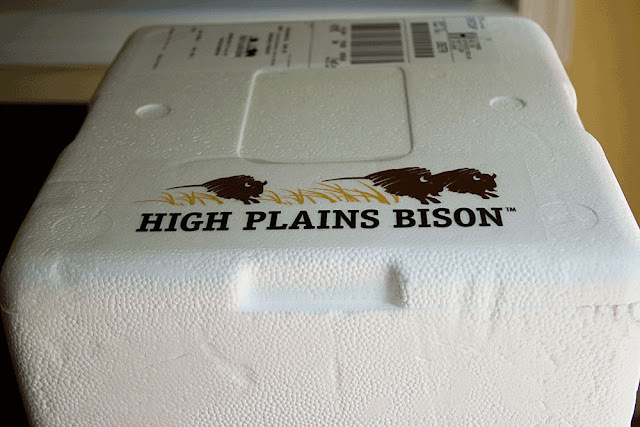 If you are a regular reader of my blog then you’ll know that I did a review of High Plains Bison sausage a few weeks back. You can find that review HERE. Then, if you recall, I took my second batch of sausage and turned it into a yummy Low Country Boil last week which you can find HERE. Today, we’re going to conclude this review with a taste of the High Plains piece de resistance, the grilled ribeye. 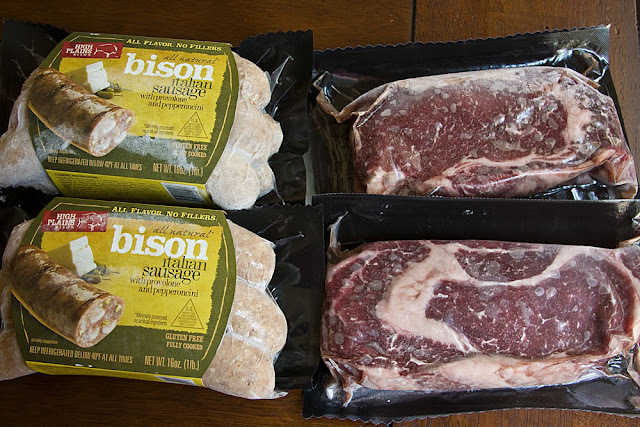 I was recently asked to try out some of High Plain’s Bison meat. It’s been well over a year since I regularly ate red meat (the treatment and feed that cows are given has really turned me away), but High Plains boasts that their bison are free range, grass fed, and all natural so I thought I might give it a shot and see if I could tell the difference from conventionally raised cows. The verdict is, not only could I tell the difference, but it was so much better that I don’t think I’ll ever need to turn to cow meat again! To top it off, bison is healthier than most of the other meat choices out there. It’s leaner, lower in fat, and higher in iron than chicken. Who would have thunk it? If you’ve been following me for a while, then you know that I absolutely adore sausage. And this was no ordinary sausage either. They filled it with honest to goodness real provolone cheese and pepperocinis. 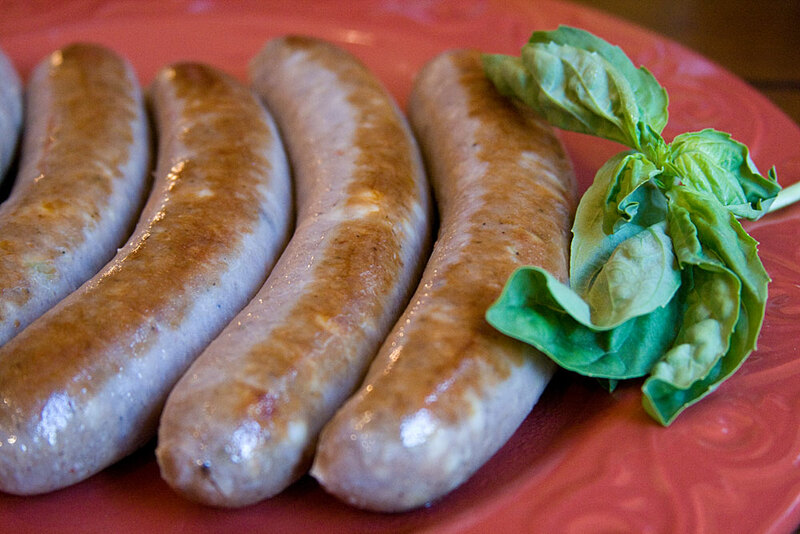 Just wait until you see how delicious the inside of these sausages were. I can hardly contain myself just thinking about it! The second cut of meat was a bison rib-eye. Scott was in heaven when he saw these. I’m not a big steak fan, but he would eat it every night if he could. I wanted something simple yet tasty to try these so we could really take in the flavor of the bison. I took a look at the recipes on High Plains Bison’s website and decided we’d try their recipe for Grilled Bison Ribeye Steak. I’m going to save the results of this recipe for next week as I already have a chocked full blogging schedule to share here this week. Tomorrow we’ll be examining the science behind a sponge cake with Beyond the Basics and the rest of the week we’ll be celebrating Indian Cuisine with a three day recipe posting series resulting in a full on vegetarian feast. Sounds pretty good, huh? 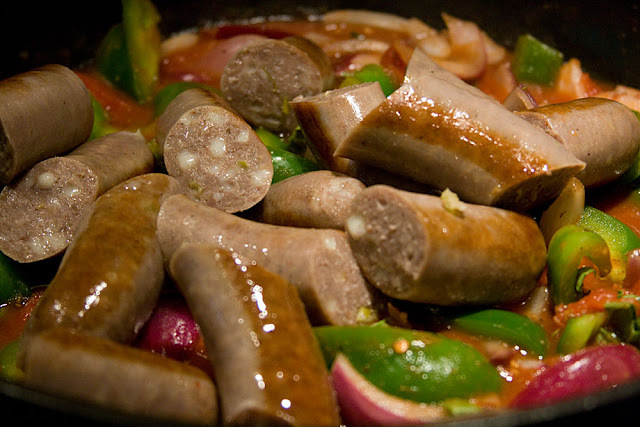 Start out by throwing a tablespoon of oil into your saute pan and cooking up your sausages on medium high heat until heated through. You can also grill up your sausages. Seeing as I am a new found grill master, I had every intention of taking this direction. Unfortunately, mother nature and my husband, who had forgotten to clean the grill from his last cooking adventure, had different plans. Before I could even get the meat on the coals, my dirty grill set fire to itself sending large toxic black plumes of smoke into the atmosphere and then five minutes later the heavens opened up, as if to retaliate on my air pollution, and dumped a pile of rain on my parade. A little embarrassing to say the least, but all’s well that end’s well. Anyway, I digress. 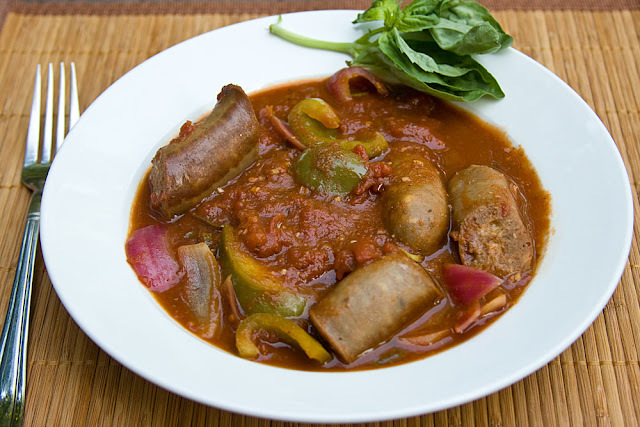 Once your sausages are thoroughly heated through, pull them off the heat and set them aside. Here’s mine. I even added a sprig of basil to attempt to make them pretty for you, because that’s the kind of gal I am. At the same temperature and in the same saute pan you cooked the sausages in, throw in your garlic, onions and peppers and cook them up for about 4 to 5 minutes. 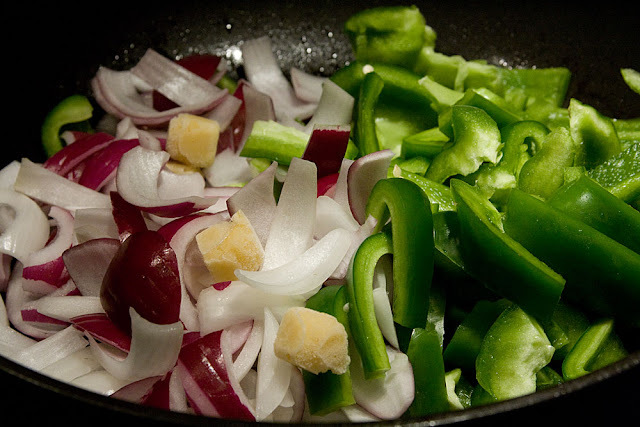 You can use any combination of onions. I had a red onion to use up so I used one red and one white. After your veggies have had about 4 to 5 minutes of cooking time, turn the heat down to medium low and add in the tomatoes (I chopped mine up a bit after taking this picture), Marsala, balsamic, sugar, and chicken base. 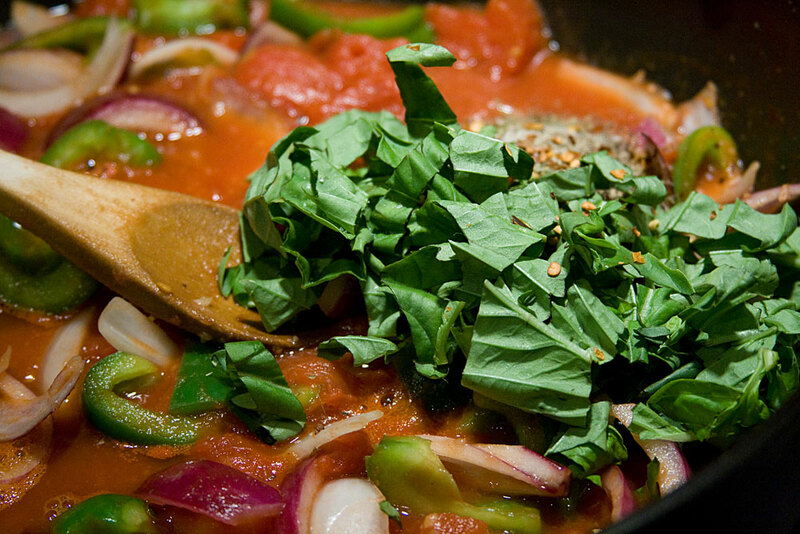 Finally, add in your spices; the fresh basil, oregano, salt, pepper, and crushed red pepper. Slice your sausages into thirds and throw them into the mix as well. Remember how I said you could see the cheese and pepperocini’s inside the sausage? Well take a look and tell me what you see. Oh YUM. Oh baby, prepare to dig into a hearty meal of sausage, onion and pepper that you won’t be able to resist. I promise.